Futher to our photoshoot post earlier today and my learning how to use flickr, this is my favorite shot of the day. Watch for it on a holiday greeting card, coming soon. 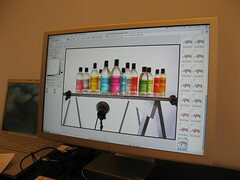 With the table, clamps and lights, as well as the test shots on screen (in production), it illustrates not only how beautiful our product are, but also how we work to ensure our suppliers (people who make bottles, design graphics, name our products, print the labels, style our shots and photograph them) and customers (people who need the photos for their sites) look great.